Driving home tonight, my mind was enjoying thoughts of Christmas. It’s coming fast! I recalled a conversation my mom and I had last summer. She told me stories about her and dad — so many things that I never knew. This one — is about Christmas. 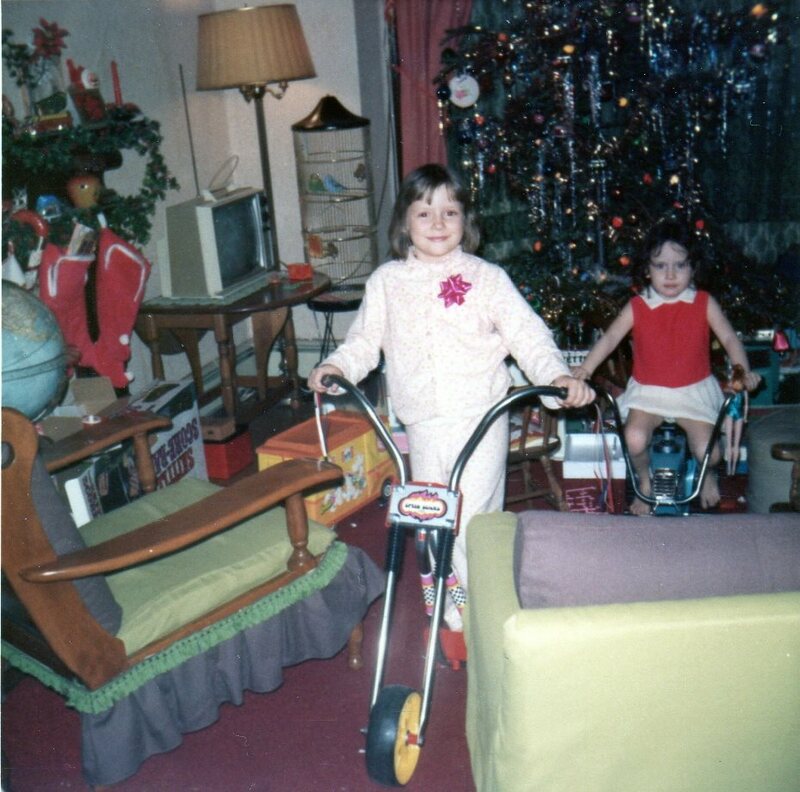 Christmas long ago. When I was a kid. My mom and dad didn’t own a home when I was growing up. We rented the first floor of a three family house in Paterson, NJ. My dad worked for an aeronautics company called Singer Kearfott. They built things for NASA and helped America send satellites into space. My mom was a home maker and a household budget keeper. Both of my parents were children of the Depression. They knew about work. Hard work. They went to work young. Neither of them had a high school diploma, but they were both so very smart. They were tenacious survivors…during a time when thriving took every bit of energy you had. Last summer — my mom told me – that every Christmas my dad would take out a loan — a loan — to give us kids Christmas. I know that may sound a little weird. But what you have to know is — my dad didn’t have a credit card. He didn’t want one. He didn’t have a checking account. He didn’t want one. He had a savings account. My dad lived on a cash basis. He would walk to the bank and pay our utility bills at the teller window. That’s how it worked back then. If he needed to pay for something where you’d use a check, he would go to the 1st National Bank on Union Avenue and get a money order to mail to National Geographic. Any car we had — he saved and paid cash. Paid cash for his cars. And every Christmas he would get a loan….for Christmas. For my brother’s bango. And our bikes. My barbie dream house. Even my older sister’s snake. Yea, that’s a whole story right there. Then he would spend the next 6 months…paying it off. His hard work..and my mother’s budgeting skills….are what gave us kids Christmas….every year. My mom said — that daddy also took out a loan every summer …to take us on vacation. No..not jets to Europe or high rise hotels. We would all load up into my dad’s Delta 88 station wagon, pulling a trailer behind us — full of our Coleman tent, Coleman stove, sleeping bags and camping gear and a cooler full of tuna fish sandwiches and Dinty Moore Stew. Daddy drove us from New Jersey to California….and we saw buffalo, Fort Coty, the Grand Canyon….we saw America. We swam in the ocean, and roasted marshmallows over the fire. We sailed kites during the day and chased fireflies by night. We grew up in Freedom and carefree summers. Then when we came home, he spent the next 6 months paying it off, while my mom made meatloaf and spaghetti dinners. We didn’t eat steak. But who needed steak…we had spaghetti and meatballs (ok, only meatballs sometimes…..but who noticed). We didn’t. Once I was grown, in my reflective memory — I knew my parents worked hard — to give us a happy American life. But I had no idea just how hard. We kids didn’t know. But again, I suppose that is also as it should be. Kids shouldn’t carry grown up worries. Yet now — as an adult– it’s incredibly important for me to know – just how much my parents invested in my life — with the blood, sweat and tears of their own lives. I have pictures of us kids on Christmas morning — in that rented house on the 1st floor — with furniture worn from the foolish games of 5 kids. We didn’t get everything for Christmas. But we got everything we could have ever dreamed for Christmas. My mom and dad….they worked their lives to give us the security of a happy home, a perspective of our great country from out the window of the station wagon and beneath our feet on the land itself. They gave us the JOY of Christmas. I sit here in humility – knowing that no matter how hard I try, I could not sacrifice even a fraction of how my parents sacrificed for me. Mom and Dad (in heaven)…..you will always be my Christmas. When I open my eyes on Christmas morning, you are what I will feel. This year and every year. Thank you for the gift of Joy. You are my Joy. Now and always.